The good news is, such a platform already exists in the form of Mastodon, which is a decentralized, federated competitor to Twitter. Unlike Facebook and Twitter which are centralized platforms controlled by corporations, a Mastodon server can be run by anyone and worldwide there are thousands of Mastodon servers. Each server admin decides the rules for their server, including which other Mastodon servers to connect to – this is what it means when Mastodon is described as “federated”. Its decentralized, federated structure is why Mastodon is much more censorship resistant than the centralized, corporate platforms. I recommend you create an account on your preferred Mastodon instance. If you’re pro-liberty, then you should try out Liberdon, which launched this summer and houses various libertarians and voluntarists. I just made a CopBlock account there today, which you can follow here. I also highly recommend following “The Police State” on Liberdon – they’ve been doing a solid job reporting on police corruption – much better than the mostly-dormant Cop Block. Facebook’s blog post explaining their takedowns basically admitted they were upset that pages like Cop Block were getting people to leave Facebook and visit their respective websites, meaning potential revenue for the sites in question and potentially less revenue for Facebook. Facebook doesn’t want you to leave Facebook. Whether there were political motivations behind the takedowns is more speculative, but it certainly reeks of it. Regardless of their reasons, perhaps you should consider leaving Facebook entirely and helping build the decentralized alternatives. It’s up to you. Mike Sylvia takes a photo with supporters outside court. State Representative Mike Sylvia is the liberty “Legislator of the Year” for 2018 according to the NH Liberty Alliance. Of course, because he’s a peaceful threat to the legitimacy of the state, he will inevitably be targeted by state violence. Hence, the people calling themselves the “Town of Belmont” have forced Sylvia into court and are threatening to hit him with $275 a day in fines for allegedly violating the town gang’s arbitrary “zoning” rules. The town gang’s zoning thug, Steve Paquin, testified under oath that the town selectmen had sent him to target Sylvia and even admitted there had not been a single complaint against Sylvia or his property by any neighbors. The only complaints came from within the town gang’s “selectmen”. What’s all this about? The gang is alleging Sylvia is living on his property in an RV or the garage. Yes, that’s right. They are threatening him with violence because he’s allegedly living… on his property. Apparently the main house burned down in 2009 before Sylvia bought it in 2011. The zoning goon claims that because he’s seen Sylvia exiting the door of the RV, observed shoveled walkways during winter, and smoke coming from a chimney on the garage, that he believes Sylvia is living on the property. Apparently living on one’s own property is not allowed within the gang’s territory, unless one has begged for permission from said gang first. It’s an outrageous case and another example of how zoning is used to target people the town gang doesn’t like and further proof that one doesn’t actually own their property. If another group of strangers can come along with armed men and tell one what one can and can’t do with it, it’s clearly the property of the gang. At one point the town attorney tries to call Sylvia to testify and he smartly objected based on the NH Constitution’s Bill of Rights Article Fifteen, which says “no subject shall… be compelled to accuse or furnish evidence against himself”. The judge sustained his objection and he did not have to take the stand, though the robed man didn’t sustain any of Sylvia’s other objections while sustaining nearly all of the town’s attorney, in a typical hearing that favored the state. All men have certain natural, essential, and inherent rights among which are, the enjoying and defending life and liberty; acquiring, possessing, and protecting, property; and, in a word, of seeking and obtaining happiness. Zoning is not only unconstitutional, it’s also immoral and should be abolished statewide. Property owners should be free to do what they want, so long as they don’t infringe on their neighbors’ similar rights to do as they please. That would be live free or die. Stay tuned here to Free Keene for the latest on this outrageous property rights violation. MPD patrolman Ryan Olsen prepares to assault software programmer and father Jeremy Kauffman. Originally streamed to his social media profile live, Jeremy Kauffman of LBRY.io has been arrested for “Disorderly Conduct” by a Manchester police officer for simply trying to leave his home. The Manchester police state descended on Kauffman’s neighborhood to conduct a homicide investigation in a home at 332 Hanover St., which is apparently near where Kauffman lives. Apparently this included preventing all the neighbors from simply leaving their own properties, a lot like being locked down in a prison by the guards. Kauffman, a respected software engineer and entrepreneur currently CEO and founder of the decentralized blockchain-based media protocol called LBRY.io recorded the threats and eventual attack by Manchester Police’s patrolman Ryan Olsen on his smartphone. In the approx two minute video, Kauffman is in his driveway and explains to the viewer that he is being kept in his property against his will by the arbitrary detention by MPD. He is not told he’s a suspect in the homicide investigation but is being prevented from leaving to pick up his son. When he merely walks down his driveway to investigate what is happening near his own home, Kauffman is threatened by officer Olsen who tells him to “go back that way” and when Kauffman asks on what law he’s basing his orders, Olsen says “I’m not gonna tell you again.” When pressed to cite the statute, Olsen pulls out the old police catch-all, “Disorderly Conduct“. Seconds later, Olsen leaves his post across the street, shouting at Kauffman, then manhandles him after telling him repeatedly to “walk back please”. Please? Is this a request or an order? Olsen arrests Kauffman, charging him with a “Class A” misdemeanor version of “Disorderly Conduct”, which means Kauffman will be facing down up to a year in jail for his heroic non-cooperation with the oppressive Manchester police state. He was released on PR bail pending arraignment in Manchester District Court. Despite the awful arrest by the terrible Manchester cops – the worst gang in the state – it was refreshing to see some courageous activist video by a Manchester area activist. Kudos to Jeremy for doing a great job standing up for his freedom to travel and proving that when the police state comes down, we’re all just in a big open air general population prison cell. If only we had more activists like him. May his example inspire others to stand up to the police state. Freedom was never won by begging. 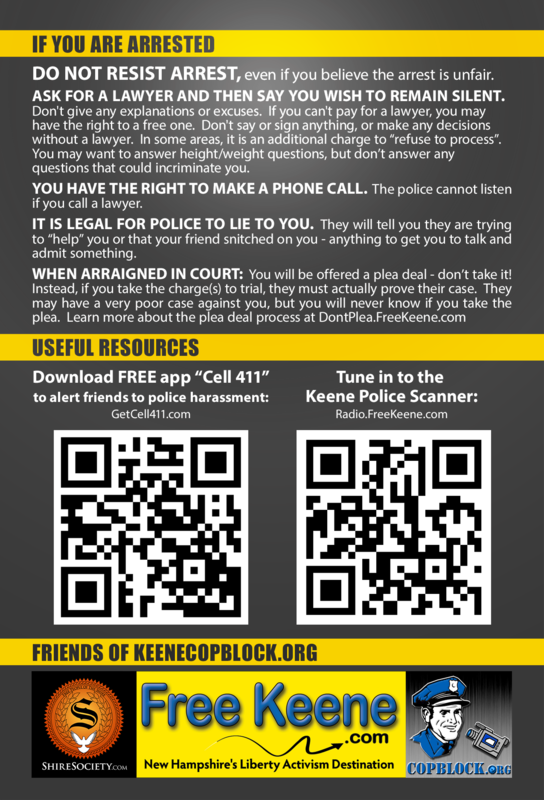 Related news: Keene Cop Block has just released our new updated-for-2018 know-your-rights flyer! 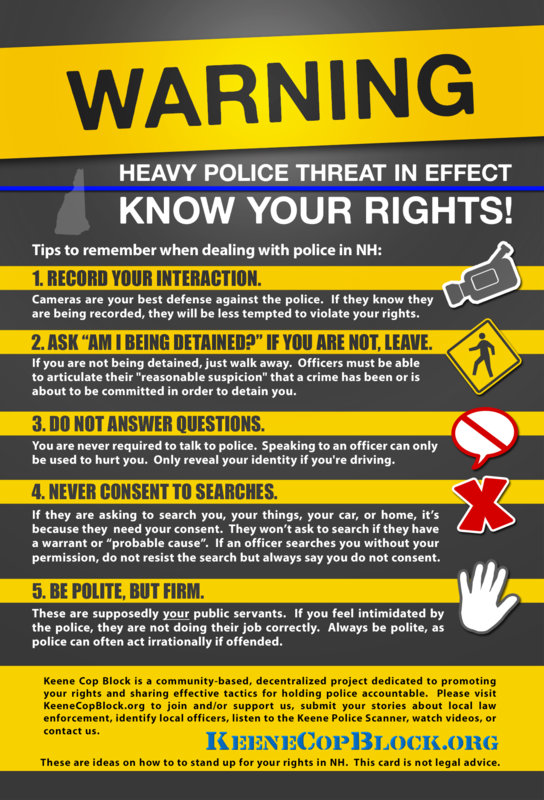 It’s a simple rundown of individual rights when dealing with the police. It is intended for distribution across New Hampshire, but may also be useful to other areas. It’s informative and keeps-it-simple. 2018 Edition: Front Side / Back Side. I’ve handed out several hundred of these in just the last two weeks around Keene State College and the students really appreciate the information. Stay tuned here to Free Keene for developments in this case. On Friday, several Forkfest 2018 attendees drove an hour South of Roger’s Campground to I-93 around Woodstock, NH – the site of the repeating temporary internal Border Patrol immigration checkpoints. Based on activist reports, the checkpoint appeared to have been operating that day from noon until 7pm. As is typical of these checkpoints, they were stopping every car to ask occupants if they are “US Citizens“. They also had a dog they were walking up and down the line of waiting cars. No one in the car was planning to answer the agents’ questions, given one has a right to remain silent (that the US Supreme Court has now required be invoked in police encounters). Obedience to tyrants only encourages them. Besides, as someone who believes in liberty, I don’t believe in government borders. Peaceful people should be allowed to enter a free country. Of course, we all know by now the United States is not a free country, and in fact has been dropping on the various international freedom rankings.